The grand dame of the Strip, the Bellagio still seems new compared to the vintage hotels of downtown Las Vegas. The hotel and casino has been one of the city's top resorts since 1998, when it was the most expensive hotel ever built. Named after the Italian town on Lake Como, Bellagio is known for luxury in a city where over-the-top is the norm. With more than 3,000 rooms, there’s plenty of space to stay at the Bellagio, but the resort draws plenty of visitors staying elsewhere too. Dancing fountains, glass flower sculpture by artist Dale Chihuly, the conservatory and botanical garden, and the weekend brunch buffet—one of the most popular in town—all bring in crowds. The Bellagio is also home to Cirque du Soleil’s aquatic-themed O, a favorite among Vegas’ many Cirque shows. Open-top bus tours down the Strip give a glimpse of the fountains, but consider stopping to watch a whole segment—it’s one of the best free things to do in the city. 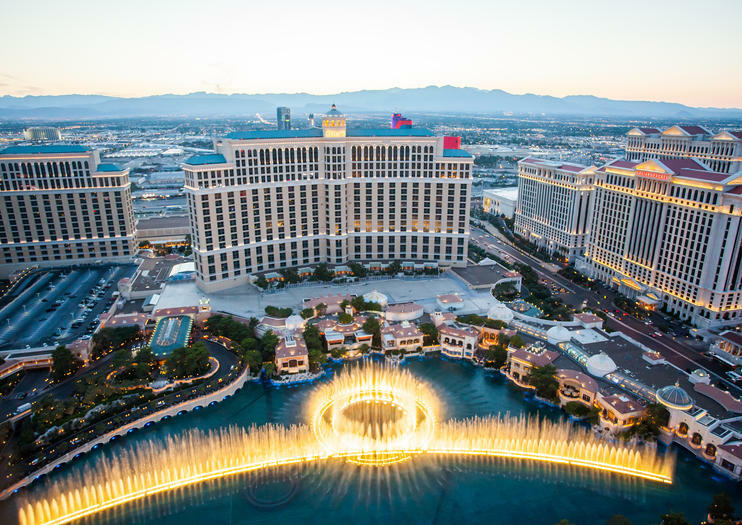 For a guided experience that includes the Bellagio, consider a bar crawl or photography tour, depending on your interests. Tickets for O can be bought online or at the Bellagio box office; the show typically runs twice a night and is dark on Monday and Tuesday. Upscale fashionable attire is requested at Hyde nightclub and Lily Bar and Lounge; more casual attire is acceptable at the other bars. While most of the Bellagio’s attractions are open to the public, the pool is reserved for paying guests of the hotel, just like at most Vegas resorts. The Bellagio has a prime location at the southwest corner of Las Vegas Boulevard, aka the Strip, and Flamingo Road. It sits next door to the Cosmopolitan and across the street from Paris Las Vegas. Grab a cab or limo from other locations around town, or give yourself plenty of time to walk, as it usually takes longer than estimated to cross the pedestrian bridges and navigate the large lobbies. Generally, the fountain show runs every 30 minutes in the afternoon and early evening and every 15 minutes at night until midnight. The weekend brunch buffet operates Saturday and Sunday from morning to mid-afternoon. Celebrity chefs love Vegas, and the Bellagio is no exception. It hosts restaurants from award-winning figures such as Wolfgang Puck, Jean-Georges Vongerichten, and Michael Mina. Make your reservations in advance if you plan to eat at these culinary hot spots. Se Las Vegas som en stjerne på denne populære klubbens krypeopplevelse. Få VIP-tilgang til tre av byens hotteste klubber og reise med festbuss gjennom gatene i Sin City. Du får profesjonelle bilder, sterke drikker og mer med denne dagen eller kvelden opplevelse. Ta en glitrende spasertur langs Las Vegas Strip på en tur fra Bellagio Las Vegas til Excalibur Hotel & Casino. Du vil spasere sammen med en fotograf som kan fange suvenirbilder underveis, med stopp på noen av Las Vegas 'mest over-the-top steder, inkludert Bellagio vinterhage, utendørs skulpturer og en høytliggende foss. Siden denne turen inkluderer VIP-opptak til Foundation Room eller The LIGHT Vegas-klubber, er det en fin måte å sparke en minneverdig kveld på byen. En profesjonell fotograf følger deg med på denne guidede Las Vegas-barskruen for å fange alt det morsomme når du gjør veien til berømte nattklubber og utrolige steder. Nyt en alkoholholdig drink på hvert stopp, inkludert en Champagne toast, og avslutt kvelden ekskursjon med spesiell VIP-inngang til en nattklubb. Du får også tilgang til opptil 100 digitale bilder av din erfaring.